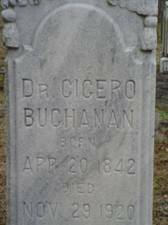 To reach the Buchanan Cemetery, travel north from the courthouse square in Waynesboro, TN on Tennessee Hwy. 13 for approximately 1.6 miles. Turn right (east) onto Mount Hope Rd. crossing the Arthur C. Skelton Memorial bridge. Continue on this road as the road goes to your left for about .9 miles. Turn right at a gate and go up the steep hill. 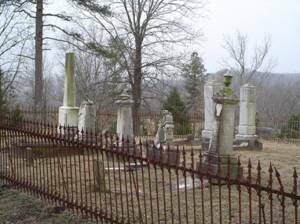 The cemetery lies to the south inside a fenced area. Artis, Agnes; b. 1854, d. ???? Hardin, Lewis R.; no dates, Co. “A” 10th Tennessee Inf. Minton, Lela; b. 16 Jul 1875, d. 31 Jan 1908, wife of Robert H.
Minton, Martha Jane; b. 24 Mar 1834, d. 16 Apr 1934, wife of John E.
Ross, Susannah E.S. ; d. 1846, consort of William B.
Skelton, Claty; b. 01 Apr 1902, d. 27 Sep 1934, wife of A.H.
Skelton, Nadine; b. 22 Jul 1917, d. 20 Nov 1919, daughter of W.H. & Zula B.
Turnbow, Ethel; b. 05 Feb 1894, d. 02 Apr 1934, wife of William O. White, William Henderson; b. 18 Feb 1909, d. 30 Apr 1989, son of Thomas S. & Cora L.
The following persons are interred inside this wrought iron enclosure pictured above. This is an impressive enclosure around the graves. It is very durable and solid even today. Hassell, Mary Ann (Biffer); b. 05 Oct 1825, d. 03 Apr 1860, wife of Amos T.